Inside Ss. 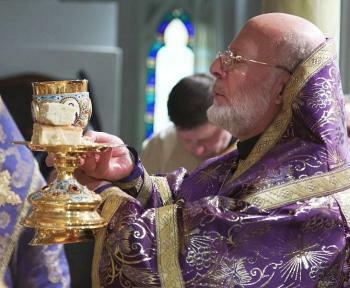 Peter and Paul Antiochian Orthodox Christian Church of Potomac, MDThe Liturgical Texts for June, blessed by His Eminence Metropolitan Joseph, are now ready for clergy and laity to download from the Online Liturgical Guide. The season of the Pentecostarion that began with Great and All-Holy Pascha concludes this year on June 7 with the Sunday of All Saints, who “shone forth throughout all the world, North and South, East and West” (Synaxarion of Orthros). In imitation of the Apostles who received “tongues of fire” on Pentecost to preach the Gospel in all corners of the globe, Orthodox Christians realize their calling on this day to do the same and become the holy ones of Jesus Christ. That is why, on the following day (June 8), they undertake the Apostles Fast, in order to spiritually prepare themselves for this witness. 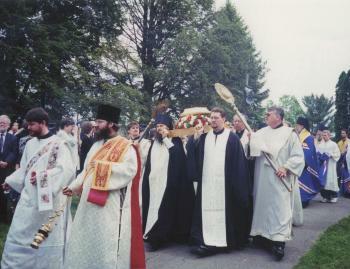 Procession with the relics of St. RaphaelOn May 29, 2015, the Antiochian Archdiocese marks the fifteenth anniversary of the glorification of our beloved St. Raphael of Brooklyn. This article by Rosemary Shumski of the Department of Christian Education, was first published in the September 2000 issue of The Word magazine. On Sunday, May 29, 2000, my family and I had the privilege of attending the glorification of Bishop Raphael at St. Tikhon's Monastery. Although we have lived in another part of the state for many years, my husband and I were born and raised in northeastern Pennsylvania. In the past, we had driven by St. Tikhon's many times, but had never actually visited. Sign up Today: Camp Season is Just Around the Corner! 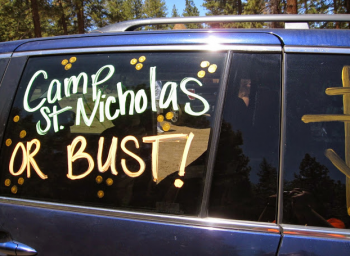 Contact the The Order of Ignatius, your parish priest, or your diocese camp, to learn about scholarships. 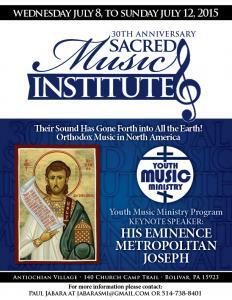 The Department of Sacred Music is thrilled to announce the Thirtieth Anniversary Sacred Music Institute (SMI), which will be held at the Antiochian Village from July 8-12, 2015. This year is promising to be the best ever! Whether you love Byzantine or 4-part choral music, there is something for everyone, from theoretical classes to private lessons in voice, chanting, conducting and vocal technique; instruction in Byzantine chant and choral conducting; special presentations and concerts from the Sacred Music Chamber Choir and the Sacred Music Byzantine Chamber Choir; and even our 30th Anniversary Musical Review! The Sacred Music Institute has it all. This very special and memorable weekend will be attended by our Keynote Speaker His Eminence Metropolitan Joseph. On Thursday, May 7, His Eminence Metropolitan Joseph was a participant in the ecumenical commemoration of the 100th Anniversary of the Armenian Genocide. 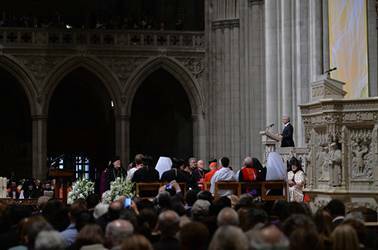 The service was held at the National Cathedral in Washington, DC. as a part of the National Commemoration of the Armenian Genocide Centennial coordinated by the Diocese and Prelacy of the Armenian Apostolic Churches of America, East and West. Accompanying His Eminence were the Very Rev. Joseph Rahal, Pastor of St. George Antiochian Orthodox Christian Church of Washington, DC; the Very Rev. Isaac Crow, Pastor of Ss. Peter & Paul Antiochian Orthodox Christian Church, Potomac, MD; and Subdeacon Rassem El Massih. The delegation was seated on the first row facing the altar. In the Armenian Genocide, over 1.5 million Armenians, Antiochians, Syrians and Assyrians perished at the hands of Ottoman Turks from 1915-1923. 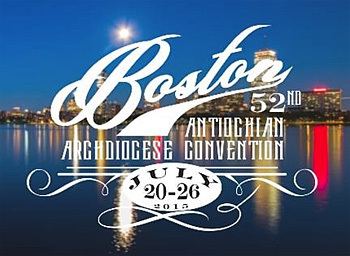 St. Mary Orthodox Church in Cambridge, Massachusetts is proud to host this year's biennial Antiochian Archdiocese Convention from July 19 through July 26, 2015, in beautiful Boston, Massachusetts. This historic city's significance in American history is a fitting backdrop as we celebrate our own history of Orthodoxy in America, the 100th anniversary of the falling asleep of St. Raphael of Brooklyn. Making this event even more historic will be the presence of his Beatitude John X, Patriarch of Antioch and All the East, presiding, and the first North American Archdiocese Convention under his Eminence Metropolitan Joseph. O Thou Who holdest the ends of the earth in the palm of Thy hand, O Jesus our God, Who art co-beginningless with the Father, and Who, together with the Holy Spirit dost rule over all things: Thou didst appear in the flesh, healing infirmities, driving away passions, and giving sight to the blind. And, by a divine word, Thou didst raise up the paralytic, commanding him to walk straightway and to take up upon his shoulders his bed, which had carried him. Wherefore, together with him we all praise Thee and cry: O Compassionate Christ, glory to Thy dominion and might. 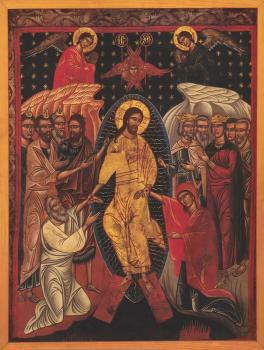 On this, the fourth Sunday of Pascha, we make commemoration of the Paralytic and, as is meet, we celebrate the miracle wrought for him. And thus this word alone was his healing. Khouria Gigi Shadid, wife of Fr. James Shadid of St. George Orthodox Church in Houston, TX, is a mother of three, a school teacher, and former youth director. Her passion is teaching with music, and she has produced five educational music CDs to date. 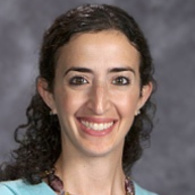 Several years ago, she developed the Matthew 25 HUGS program, or Hands Used for God's Service, in cooperation with the Archdiocese's Department of Christian Education. The goal of the program is to nurture generous spirits in the children of our church schools, with targeted activities and lessons at every grade level until children graduate from high school. Antiochian.org asked her to explain further. Where did the idea for the HUGS program come from, and what do you hope to accomplish with it? My cousin, Georgina, is known for giving great hugs. One day, we were talking and she began telling me about how much she wishes she could go to the NICU at a hospital and just hug on the little babies there. I told her that her loving hugs are one of the gifts that God has given her and that she should share those hugs with as many people as she can. As we talked, Georgina expressed a desire to do more with that gift... but what? Hear the voice of gladness, O women; for I have trodden down rebellious Hades, and raised the world from corruption. Wherefore, hasten ye and proclaim the glad tidings to My beloved; for I desire that joy shall break forth thence upon My creation, whence first came forth sorrow. 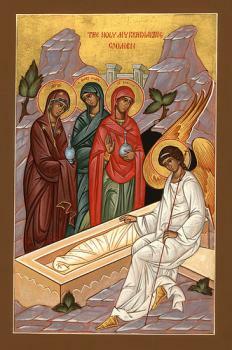 On this day, the second Sunday after Pascha, we commemorate the Holy Myrrh-bearing women Saints Mary Magdalene (July 22), Mary the wife of Clopas, Joanna (June 27), Salome, mother of the sons of Zebedee (August 3), Martha and Mary, sisters of Lazarus (June 4). We also commemorate also Saint Joseph of Arimathea (July 31), and Nicodemus. We extend our prayers and love to His Eminence Metropolitan JOSEPH on the occasion of his Name's Day! And I bring a hymn as it were myrrh unto them. Our bishops, Paul and John, are on trial; they were once put on trial at the beginning of the Christian kerygma, and now they are put on trial once again, in the same geographical spot, although bearing different names. It is a unique trial, not only in the East, but also in our contemporary world. The convoluted nature of their trial does not strike the terrestrials only, but the celestials also, since it is a struggle, where the Great Judge will prevail, for He has the final ruling in this case, the case of the True Man and of the True God. 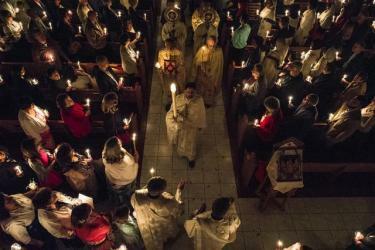 As the Antiochian Archdiocese's first Great Lent under the leadership of Metropolitan Joseph concluded, parishes around the United States and Canada commenced the services for Holy Week and Pascha. Throughout the solemn week, the faithful gathered frequently in worship and prayer, finishing the week with the joyous celebration of Pascha on April 12, 2015. Our photo gallery presents a colorful summary of this apex of the Church year. If your parish isn't represented yet, it's not too late! Send your photos to editor@antiochian.org, and we'll include your community in the gallery. Let the heavens rejoice and the earth be glad, as is meet; and let the whole world, visible and invisible, feast; for Christ hath risen to everlasting joy. We greet you with great joy and love as we celebrate the Feast of the Holy Resurrection of our Lord and God and Savior Jesus Christ. We are reminded by the hymn quoted above that the entire universe rejoices in this singular event which brings new life to all creation. Even the current state of violence and hatred which plagues this world is shattered to pieces by the Lord's descent into Hades and his resurrection from the dead. 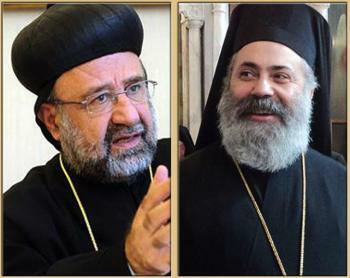 We ask all of the faithful to continue to pray for the two abducted bishops, Metropolitan Paul, and Archbishop Youhanna, and the victims of violence around the world, especially in Syria and in the entire region. The victory of our Lord Jesus Christ over the powers of death, and the hope of new life are indeed our only consolation during these troubled times. The triumph of this Paschal season strengthens our faith and renews our hope. Let us therefore rejoice with the heavens and celebrate with the entire universe on this, the Feast of Feasts! Fr. Justin Havens of Ss. 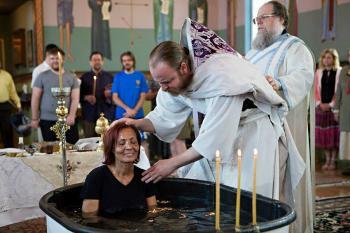 Peter and Paul Antiochian Orthodox Church of Salt Lake City, Utah baptizes new Orthodox Christians on Holy Saturday, 2014.The liturgical texts for April, blessed by His Eminence Metropolitan Joseph, are now ready for clergy and laity to download from the Online Liturgical Guide. By now, Orthodox Christians have completed their Lenten journeys by entering into the festive, albeit brief, period of Lazarus Saturday and Palm Sunday. When our Lord, God and Savior Jesus Christ raised his friend Lazarus from the dead after four days, He confirmed "the universal Resurrection." That is, our Lord shows us that He will raise all of those who believe that He is Life. 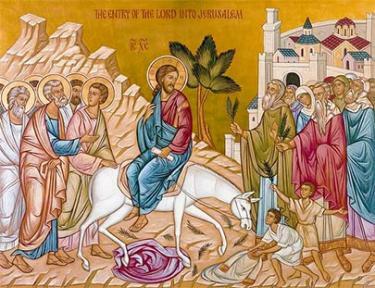 Then, on Palm Sunday, we commemorate our Lord's triumphant entry into Jerusalem where the people cried out "Hosanna!" (or, "save us now!) and waved palms as symbols of victory. 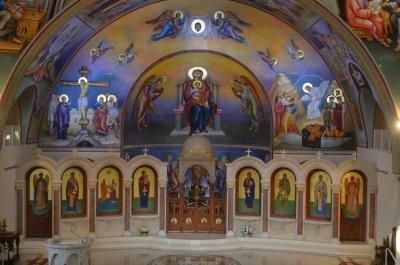 Antiochian parishes around the world festively celebrate this day as a second Pascha, bearing candles and palms in large outdoor processions. 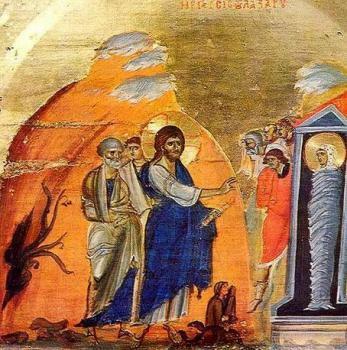 The Raising of Lazarus (Mount Sinai, 12th c.)"Though I lie in bonds, O Savior," Lazarus cried from below to Thee his Deliverer, "yet shall I not remain forever in the depth of Hell, if Thou wilt only call to me, ‘Lazarus, come out;’ for Thou art my Light and my Life." We greet you with love and joy on this Palm Sunday which celebrates the Triumphant Entry of our Lord Jesus Christ into Jerusalem. The Kontakion for the feast which is quoted above expresses with great eloquence the worship and praise which are due to our Lord and God and Savior Jesus Christ by His children. 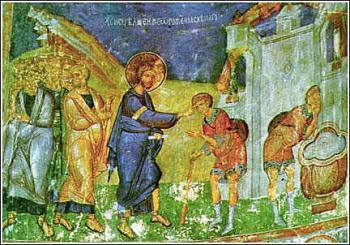 Today He enters Jerusalem not majestically as an earthly king, but as a humble servant. He who is the mightiest King of all deigns to sit on the back of a lowly beast so that He might teach us humility. Thursday, March 19, 2015, marked the one year anniversary of the repose of His Eminence Metropolitan Philip of thrice-blessed memory. On Sunday, March 22, His Eminence Metropolitan Joseph celebrated the Divine Liturgy and one year memorial for Metropolitan Philip at St. Nicholas Cathedral in Brooklyn. In his eulogy, Metropolitan Joseph spoke about the many accomplishments of Sayidna Philip over 48 years, but in the end reminded the faithful that ultimately his desire to build up the Archdiocese and its institutions was driven by his desire to bring people closer to Christ so that the Orthodox faith could manifest itself on this continent. His Eminence Archbishop Demetrios of the Greek Orthodox Archdiocese of America also attended and, after concelebrating the memorial, gave a wonderful homily recalling his many years of working with our late Metropolitan in both SCOBA and the Assembly of Bishops. He remembered both his strong convictions and beliefs as well as his love and ability to cooperate. Verily, Gabriel did come to thee, disclosing the purpose which was before the ages, hailing thee and saying, Rejoice O unseeded land! Rejoice, O unburning bush! Rejoice, O depth inaccessible to vision! Rejoice, O bridge leading to the heavens! 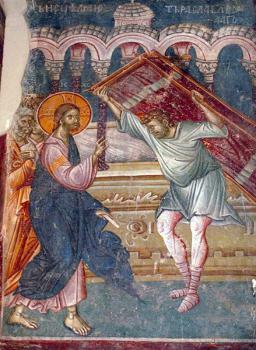 Rejoice, O lofty ladder whom Jacob did behold! Rejoice, O jar of divine manna! Rejoice, O dissolution of the curse! Rejoice, O recall of Adam! The Lord is with thee. Rejoice, O Theotokos, O deliverance of Adam from the curse! Rejoice, O chaste Theotokos! Rejoice, O living bush! Rejoice, O lamp! Rejoice, O throne! Rejoice, O ladder and door! Rejoice, O divine chariot! Rejoice, O bright cloud! Rejoice, O temple, O most-gilded jar! Rejoice, O mountain! Rejoice, O tabernacle and table! Rejoice, O deliverer of Eve! 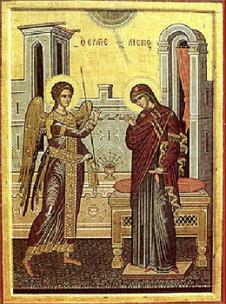 We greet you with love and joy on this Feast of the Annunciation of the Archangel Gabriel to the Most Holy Theotokos. The reading above transmits to us the essence of this feast, which is the action of a loving God which initiates the events by which humankind is saved from the ancestral error of Adam and Eve. The Archangel announces to the woman who will become the Most Holy Theotokos that she has been chosen to be the vessel through which God Himself will take human flesh, become a Man, and dwell among his creation.